I was walking on the north side of the big white farmhouse, noticing how the ferns had completely overtaken the space between the foundation and the sidewalk, when I was startled by a strong voice. It came from the bathroom window on the first floor: “Grandma wants to tell you how to do flower arranging now.” I stopped, leaned against the red water pump, and sighed deeply. I sorely needed the lesson. A few weeks earlier, I had been heavily involved in a big bruising fight with certain, blue, purple and yellow members of the iris family. Grandma, shouting directions from the sidelines, finally had to intervene to salvage my bouquet fort the church altar. The flowers were limp from battle, and so was I. “Don’t you want me to come and listen?” I asked. “No,” she said, I can tell you from here.” I couldn’t see her, though I guessed she was leaning, chin in hand, on the window sill. I knew she could see me, adding another-worldly dimension to our conversation. “I’m going to tell you all my secrets of flower arranging,” she began. My ears perked up. She knew what she was talking about. In the dining room, garden club and state fair ribbons shone from corners of the china cabinet and spilled out the drawers of the buffet. “Watch how God grows the flowers,” she said. “If the flowers grow close to the earth, use them at the base of your arrangement. They’re your cover flowers. If they stand up straight and tall, like the lilies, use them in the center for your height. In every pick, there are flowers that want to be together. Let them rest against each other in your bouquet,” she continued. “If the flowers bend in the garden, let them bend in the bouquet. Never force them. Never violate the nature of things,” she emphasized. No wonder I had such troubles with the irises, I thought. “Fill in the spaces with your extra leaves,” she said. “Is that why I run out of greenery?” I asked. “Yes, you‘ve been cutting your stems entirely too short, Janis. If you just listen, the flowers will tell you where to place them. And always have potential bloom in your bouquets,” she went on. “Tell me what potential bloom is,” I interrupted again. “Buds. Flowers just coming on. They’re like, well, children in a family. So your arrangement has some life and hope to it. So it can grow and change…unfold. You must always have potential bloom. Hear that?” she said. “I have to go now–the stove is calling me,” she said, and started back to her chicken and noodles. “Thanks, Grandma,” I said loudly, knowing she could hear me over the early summer breeze that had picked up and had begun rustling the maples. Grandma had keen hearing at age 92. Janis Pyle is an active member of the Northern Plains District. She gives workshops/insight sessions in intentional story-sharing as a means of congregational revitalization. 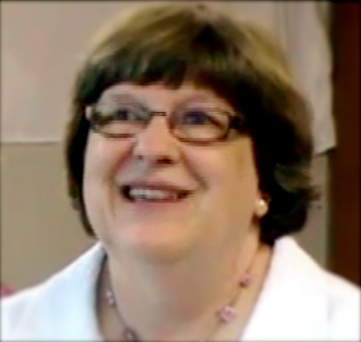 She was coordinator for mission connections for the denomination from 2001-2009.